When it comes to buy the countertop material for your dream kitchen, you may not be able to take the right decision. Granite, Quarts and Solid Surface all are the most common countertop materials, but which one you should buy depends on variety of reasons, i.e. your requirements, budget and the usage. In order to help you decide the right material, let us do a quick comparison. The very first thing you should know is what is there inside each material; Granite is 100% Natural stone, Quartz is man-made and contains 85%-95% crushed quartz with a resin binder while solid surfaces are also man-made and have Acrylic or Polyester Plastics inside. Granite is not affected by heat at all and is highly resistant to scratches as well; so can be the best choice if this is your concern. Quartz can be affected by high heat when it is over 400 and for scratches it’s again highly resistant too. On part of solid surfaces, they are not heat resistant and hot pans may warp, melt, crack, or discolor the solid surface and they get scratches easily too, so you need to be extra careful about solid surface countertops. If cleanliness and hygiene are your main concerns, you may opt for Granite or Quartz as they both are highly resistant to bacteria. If you opt for Solid surface, it may not be that hygienic as it gets scratches easily; it absorbs the moisture quickly and is very likely to provide shelter to bacteria if it’s not cleaned properly. Fabrication may not be the concern if you’re more concerned about the hygiene and longevity, however it may be if you’re looking for styling as well. 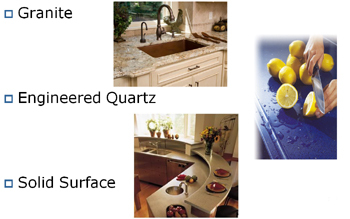 Granite and Quartz may require seams, but Solid Surfaces are seamless and are usually set on a wood sub structure. On part of appearance, granite has the best finishing as it comes highly polished. Quartz comes second with fine polish and finishing while Solid surfaces have matter finishing. Maintaining granite is comparatively easier, and Quartz comes second. Both may need periodic sealing to prevent staining. Solid surface on the other hand needs extensive care, however, scratches and stains can be sanded out with periodic polishing. Granite is the most expensive one, while Quartz is in middle and Solid Surface is comparatively cheapest of all. There may be a big difference in prices of Solid Surface and Quartz, but when it comes to compare the prices of Quartz and Granite, the difference is not much. If you’re on budget, you may look for Solid surface, if it’s concern of luxury, then granite and if you are looking for affordable luxury, Quartz will best suit you!